IBM's System z mainframe business has recovered somewhat after stalling and not meeting expectations in the first quarter, and Big Blue is going to try to build some momentum by shipping a new line of midrange-class mainframes that sport lower prices than the current top-end zEnterprise EC12 machines announced last summer. The new line, called the zEnterprise BC12, is based on the same six-core z12 engine developed and fabbed by IBM that the high-end zEnterprise EC12 machines use. But as is always the case with so-called "Business Class" mainframes, the engines these boxes use are geared down a bit as are other capacity metrics (memory, I/O, and so forth) compared to their "Enterprise Class" older siblings. When it comes to mainframes, IBM starts out by appeasing the capacity needs of its largest mainframe shops with any new processor technology, and once it can confidently meet demand, it downshifts to the midrange boxes and chases a slightly different class of customers whose processing needs are more modest – along with their budgets. You might think that these smaller mainframes are aimed at customers who might still be using vintage mainframes from days gone by instead of upgrading to shinier new iron. But Greg Lotko, who is the business line manager in charge of System z products and marketing at IBM, says that this is not the case as it had been in the past. "We have fewer and fewer clients that have moldy oldies," says Lotko, "and that is for economic reasons as well as for performance ones." As IBM has announced each successive generation of mainframes in the past decade, it has offered faster engines and more aggregate performance, generally at a better bang for the buck. But equally important for customers have been the succession of software and maintenance price decreases for customers who move to new iron. Mainframe shops have to rent mainframe systems software from IBM on a monthly basis (either per core or per unit of performance), and as an example, IBM is giving some customers 100 MIPS of selected software at a 90 MIPS price if they move to the new machine, according to Lotko. In other cases, as customers increase the capacity used on their mainframes, the per-unit cost of a software license tends to go down much more quickly on a new machine compared to an older one. Generally speaking, across all of the various mainframe systems software commonly used on the System z BC machines, this time around customers can expect something on the order of a 3 to 10 per cent cut in their monthly software bill just moving to a machine with exactly the same capacity as gauged in mainframe MIPS. What Lotko wants to make clear is that the System z BC server business, while being smaller than the EC business, carries its own weight. Lotko says the BC machines are not a loss leader as is the case for some exotic cars that auto makers put in the line to test new technologies or draw customers into the showroom. "The BC unto itself is a profitable business," he says. But then again, the mainframe hardware business usually generates somewhere between $3.5bn and $4bn a year in revenues for IBM, so this is money well spent – particularly when you see that those machines easily generate billions of dollars more per year in extremely profitable software revenues, all flowing in monthly like utility bill payments. And that is precisely what they are, incidentally. IBM was doing metered monthly pricing long before that became one of tenets of cloud computing. Some mainframe shops are all EC boxes, and some have only one or two BC boxes. But in some cases, a big EC shop will use a BC machine as a coupling facility for a Parallel Sysplex cluster, which provides fault tolerance as well as scalability for databases, middleware, and applications running on IBM's flagship z/OS mainframe operating system. Still others have EC boxes running the core apps at headquarters and plunk BC machines in regional offices, manufacturing facilities, or warehouses to do local processing. 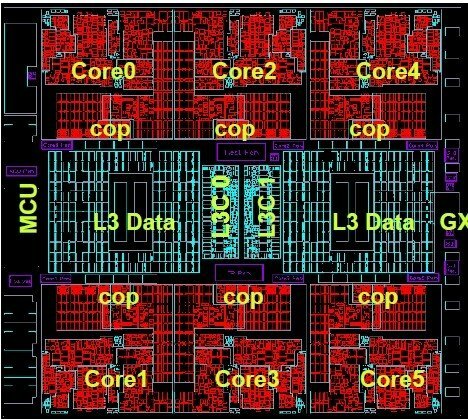 The System z BC12 machine is based on the same six-core engine that is used in the EC12 servers announced last summer, except these are geared down from the 5.5GHz they run at in the EC12 machines to 4.2GHz in the BC12. The on-chip L3 cache is also cut back to 24MB, and the L4 cache that sits on the switch/hub that implements symmetric multiprocessing (SMP) for multiple single-chip modules is cut back to 192MB. But to customers using BC style machines, the BC12 is going to be a big upgrade opportunity for a number of reasons. First, the engines used in the BC z114 machines announced in July 2011 were implemented in a 45-nanometer chip etching process and only had four cores on a die, but only three of them were active – the other was a dud that was discovered as part of the EC bin sort. By shifting to the BC12 system, shops using the BC z114 machine will be able to expand their RAID-protected main memory capacity up to 496GB as well as having double the number of compute engines, each with twice as much cache memory and a 36 per cent clock-speed boost. The combination of faster clocks and more motors, made possible by a shift to 32nm processes, gives the top-end BC12 machine 62 percent more aggregate oomph than the z114 box it replaces. Let's get a little more specific about the feeds and speeds comparisons between the old and new BC mainframes. There were two models of the z114 system, the M05 and the M10. Both machines had a 3.8GHz z11 engine that was rated at a raw 782 MIPS, with the entry performance band set at 26 MIPS. The single-drawer z114 had up to five configurable engines and could scale main memory to 120GB, while the two-drawer M10 had up to 248GB of main memory and up to ten configurable engines. With all ten engines fired up, that came to 3,139 MIPS of aggregate performance after SMP overhead was taken off the top. Customers could have anywhere from zero to five of the engines in either the M05 or the M10 as compute processors, or CPs in IBM mainframese; any extra processors in the box could be configured to be an Integrated Facility for Linux (IFL), which is a fancy way of saying a lower-priced engine restricted to running Linux, or as a zIIP or zAAP coprocessor for a CP. The zIIP runs a special subset of DB2 database code and is used to offer low-cost database processing, and the zAAP does the same for Java workloads. The CPs can also be used as coupling facilities (CFs) in Parallel Sysplex clusters. All of the engines in a z114 can be used to run the CF software for Parallel Sysplex, but IBM has set a limit that CPs and zIIPS or zAAPs have to be kept in a one-to-one ratio. IBM needed the higher CP revenue stream, with CPs costing an estimated four to five times what a so-called "specialty engine" runs on a mainframe. With the BC12 boxes, IBM is rasing that ratio to two to one, which means you can now have twice as many specialty engines in the box as CPs. This was done because customers demanded it, says Lotko, and in fact, this ratio is being backcast to the high-end EC12 machines as part of Tuesday's announcements. Now, for the new BC12 iron. That z12 motor running at 4.2GHz provides a raw 1,064 MIPS of capacity, and the entry capacity on the BC12 H06 or H13 models is set at 50 MIPS, which is double that of the z114 machines it replaces. However, IBM is keeping the base price for the BC12 machine at the same $75,000, so it is like getting 25 MIPS for free. The z/OS workloads can scale across up to six CPs for a maximum of 4,958 MIPS. The BC12 H06 can have up to four zIIPs or zAAPs with two CPs minimum configured to run z/OS, zVM, or z/VSE workloads, and you can configure all of the CPs as Linux engines or coupling facilities if you want. The BC12 H13 has a total of eighteen z12 motors and can have up to seven zIIPs or zAAPs with four CPs and you can allocate all thirteen configurable motors to run Linux or coupling software. The leftover engine in the H06 and H13 machines is used as an Integrated Firmware Processor, or IFP, and this is used to run the InfiniBand RoCE protocol (Remote Direct Memory Access over Converged Ethernet) protocol for 10Gb/sec Ethernet adapters, as well as running the zEnterprise Data Compression software. The data compression is interesting, but the use of RDMA, even if it is over Ethernet instead of InfiniBand proper, is probably more interesting to customers who have mainframes at the heart of their n-tier applications. IBM says that using RoCE on Ethernet adapters and running this software on the IFP can help reduce network latencies by as much as 80 per cent between the database tier running on mainframes and application tiers running on other mainframes or other kinds of systems. There are 156 different MIPS performance settings in the new BC12 machine, up from 130 different settings with the z114 box. IBM is particularly keen on pushing the BC12 machine as a Linux drafthorse. If you allocate all thirteen engines in the top-end box to running the z/VM hypervisor, you can get up to 40 virtual Linux servers per core and up to 520 virtual Linux servers per system, and IBM says that a fully burdened mainframe setup can do that for as little as $1 per day per virtual server. Big Blue says this is 55 per cent less costly than a rack of x86 servers configured to do the same job. As usual, El Reg cautions against such vague comparisons, and would love to see how much work a Linux slice with an effective 105MHz of processing capacity and just under 1GB of memory is going to perform doing real work. That criticism does not mean customers can't find good economic reasons to run Linux on a mainframe, but the arguments are bound to be more about how the mainframe has higher availability and can share z/OS data than about how they are cheaper than x86 iron. 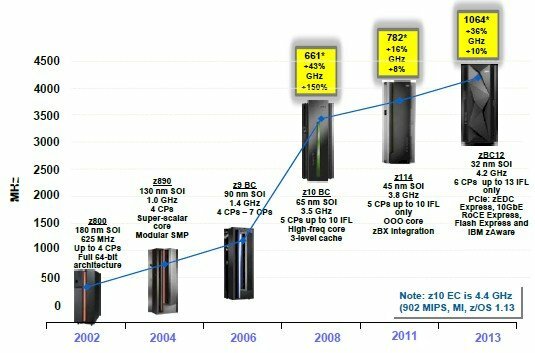 The good news for mainframe shops is that IBM has boosted the price/performance of specialty engines by 27 per cent, comparing the BC12 machines to their z114 predecessors. IBM did not provide the actual list prices for these engines, of course. And that is bad behavior, of course.